Just in: Associated Press's Clarence Roy-Macaulay reports that Health Ministry spokesman Sidie Yahya Tunis says that arrangements are being made to evacuate her to another country so she can receive better medical treatment. She is the fourth Sierra Leonean doctor to become infected during the current outbreak in West Africa. So far, only westerners have been evacuated for treatment abroad, Roy-Macaulay wrote. 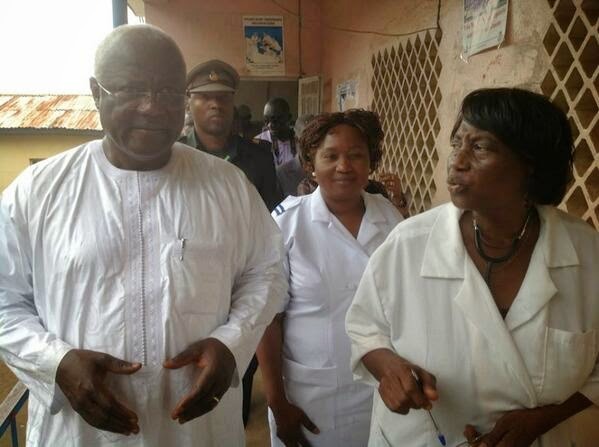 Last October, President Koroma celebrated his 60th birthday visiting orphans and the sick. He went on a needs assessment visit to several hospitals and health centers in Freetown, the nation's capital. The president visited the Lumley Government Hospital, Kroo bay community health center, Princess Christian Maternity Hospital, Ola During and Connaught hospitals, and the Freetown Cheshire Home at Racecourse, Cline Town. Local papers reported that at the Lumley Government Hospital, President Koroma was briefed by Dr. Olivette Buck about plans by the Ministry of Health and Sanitation, in collaboration with Freetown City Council to refurbish the hospital. In the photo, Buck is shown leading the president on a tour of the hospital. The doctor told President Koroma that the operating theater had leaks. She also informed the president about lack of a storage facility for drugs, including those that are being provided for free healthcare.